"Economic Reform" is the recent mask wore by UPA as a part of their political game to deviate the attention of people from making sense of the economic deterioration. If you look behind the mask, the face of UPA is still dirty. I perceive that these political chameleons coin the irrelevant initiatives which are not at all synonymous to what they actually mean and in fact, they are trying to mobilize the contemporary Indian economy from worse to worst phase ever. After numerous agitations and controversies, this sarcastic mask of useless reforms comprises some senseless naive policies like intrusion of FDI in multi-brand retail, LPG cap limit and diesel price hike. Though these policies seem like elegant measures of the Government if you see from a bird eye view, intensely, they all need exhaustive implementation which is ultimately the impossible expectation from their side. Then what is the need in introducing these so called reforms? I am completely clueless why the person who is solely responsible for the economic freedom of the country is today keen on these baseless reforms! 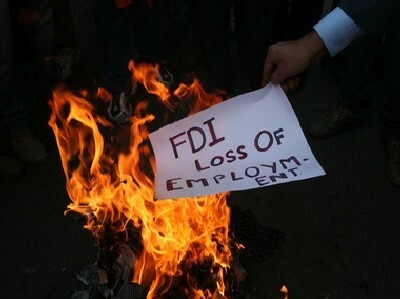 "FDI" which could apparently be tagged as "Firewall Destructive Infusion" of the huge Indian Retail fortress. Yes, hopefully it would demolish the Indian retail firewall if the policy is introduced with no strict legal regulations. But, we could ponder about this contentious issue in two complementary angles. Positive contemplation is that we could get huge capital investments entering into our economic cloud which could enhance the fund flow in the national financial hierarchy and would result in the slight increase in GDP and thereby slight fall in inflation rate. Boom in retail sector would create many naive jobs throughout the business line and also the consumers would enjoy quality products with compressed pricing. Negative contemplation leads to the drastic decline of middle level retail sectors like Kirana stores which in turn would result in joblessness. Ambiguity would be consistent in the survival of the farmers in the offing due to foreign intervention in the supply chain. From the complete study of the functionality of FDI driven retail sector in various Asian countries like China, Japan, Malaysia, Philippines etc, we could conclude that the probability of holistic lucre is far better in latter case (discarding FDI) than the former one. In case of approving the latter one, many legal restrictions should be strictly incorporated which is quite impossible with our current spineless bureaucracy. Statistically, for every 1500 jobs created by foreign giants like Wallmart, there would be a loss of 4000 jobs in the middle level which sounds completely superfluous. Coming to quality of products, we could place our hope on the current competitive Indian retail behemoths like future group, Reliance, Aditya Birla Group who would bring down the pricing scale of products nominally with better quality. Besides, mark my words that the huge capital via this gateway of FDI would take a new corruptive avatar in the near future which would probably triumph all those renowned Forbes, 2G, commonwealth and Coalgate scams of the century. So, no matter who opposes the policy, UPA would welcome it with red carpet bothering no diatribe. Apropos the consistent fluctuation on crude oil prices on the global floor, Indian Government has made it a habitual practice of dumping all the subsidies to their bigger figures so as to make the hikes on fuel prices as periodical customs. Aam Aadhmi get used with this "persistent overloading & dumping" and he has learnt to least bother the hikes and cornered to adapt to conservative life. This new cap limit in LPG is again a hard hit on his rear head to alarm him that UPA is still ruling his country. The stringent objective behind the Government policies is to magnify the gap between the upper and the lower middle class which would engender serious discriminatory consequences in the offing. So, no point in incorporating this diesel hike and LPG cap policies which would again kindle agitation among the people which would diminish in due course. On the other hand, only modicum monetary generation would be possible out of these pointless initiatives. If you contemplate from productive angle, these policies stand nowhere in the profitable accomplishment. But still, UPA is cornered to wear this mask to safeguard their baseless Rajneethi with resultant partitions which would end up in nothing. Even the shuffling of their allies make the party bit more complex. Seemingly, they are moving out of their tactic track of political game in garnering their vote banks. That doesn't make the NDA as the better replacement for UPA folks at any cost. End of the day, people are the bees to be eaten! Eventually, I wanna state that these reforms are undoubtedly welfare measures for the country's economic paralysis, provided implemented by considering the future consequences which is hardly possible! Anyways, it is already late. Pan is on heat! Let us lit the candle of hope as usual! Again, I would like to rephrase what I used to feel, "It is high time for Revolution! ".